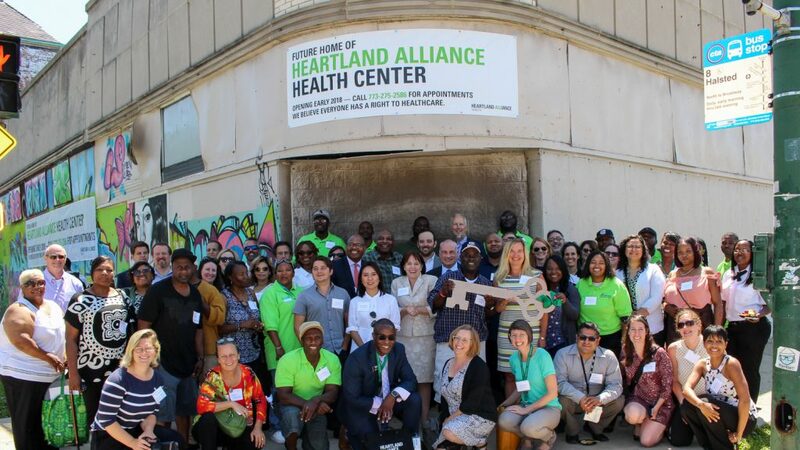 On July 25, 2017, Heartland Alliance Health and community partners gathered in the Englewood neighborhood to kick-off renovations and construction of a new health center. The future health center, located at 5501 S. Halsted Street (corner of Garfield Boulevard), will provide primary medical, substance use treatment, mental health/psychiatry, insurance assistance, medical case management, specialty referral care, and chronic disease management including HIV/AIDS care. The 7,900 square foot building will have ten exam rooms, a triage room, and a pharmacy. Additionally, the building will have showers and laundry to support people who are homeless or unstably housed. Heartland Alliance Health also provides insurance assistance and counseling. The project responds to the scarcity of healthcare in an area where homelessness and poverty are on the rise. As a result of being unable to access, afford, or maintain healthcare, residents of Englewood and the surrounding communities have a lower life expectancy, greater incidence of diabetes and heart disease, fewer cancer screenings, and higher infant mortality rates. Lack of healthcare leaves people vulnerable to lost wages, unemployment, chronic illnesses, and homelessness. Because people experiencing homelessness often have multiple and chronic health needs, they tend to use costly emergency room services, and may require assertive outreach and engagement to access health care, maintain contact, and adhere to treatment regimens. Heartland Alliance Health is Chicago’s only Federally Qualified Health Center (FQHC) for people experiencing homelessness providing comprehensive health care. For more than 30 years, Heartland Alliance Health has provided quality care for all, regardless of citizenship or health insurance status. Heartland Alliance Health proudly serves those who lack housing and are most at risk in our communities.